Last week’s record breaking polar arctic temperatures did more than just chill us to the bones. It actually rapidly expanded the ice that covers the surface of our Great Lakes. I bring you this news so you understand just how cold it was here in Michigan as well as our surrounding states. In the winter of 2013-2014 the ice cover was remarkable. 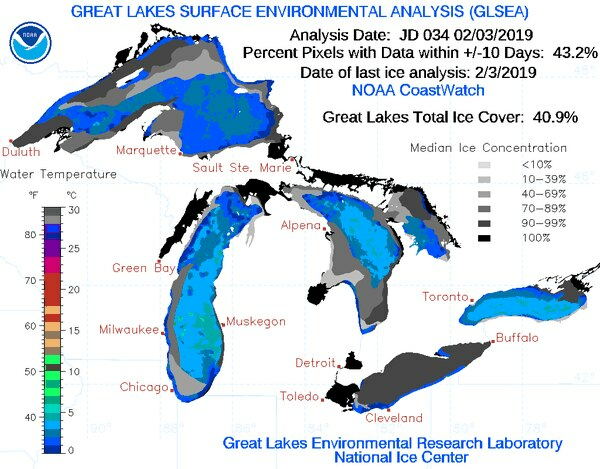 At this time in 2014, there was 70 percent ice cover on the Great Lakes, and heading to a peak ice amount of 96 percent frozen. What is interesting to me is the rapid expansion of the ice covering the Great Lakes in such a short time.